Get Happy Cards | Happy Cards - Happiness & Kindness Cards! HAPPY CARDS GIVES YOU 30 WAYS TO FEEL AMAZING EVERY DAY! YOU WILL FEEL GOOD! FEEL REALLY REALLY GOOD! FEEL GOOD! FEEL REALLY REALLY GOOD! AND IT CONTINUES WHEN YOU GIVE THE CARDS AWAY EACH DAY! THAT’S RIGHT! THE REASON TO GET THESE CARDS IS TO GIVE THEM AWAY. AND SEE THEM SMILE AND HEAR THEM THANK YOU. LOOK AT LIFE AND THE WAY YOU FEEL. a super exciting mission to spread kindness and happiness and you can join me! I am not here to sell these so much as I am to offer you the chance to experience them for yourself. in the world I know you’ll love them. Happy cards has given my life a new purpose and mission, the mission of feeling more happiness and sharing more kindness everywhere around me! You can be a part of the kindness movement and create ripples of kindness, positive feelings and happiness. You can share these with your kids, your colleagues, classmates, neighbors and more! 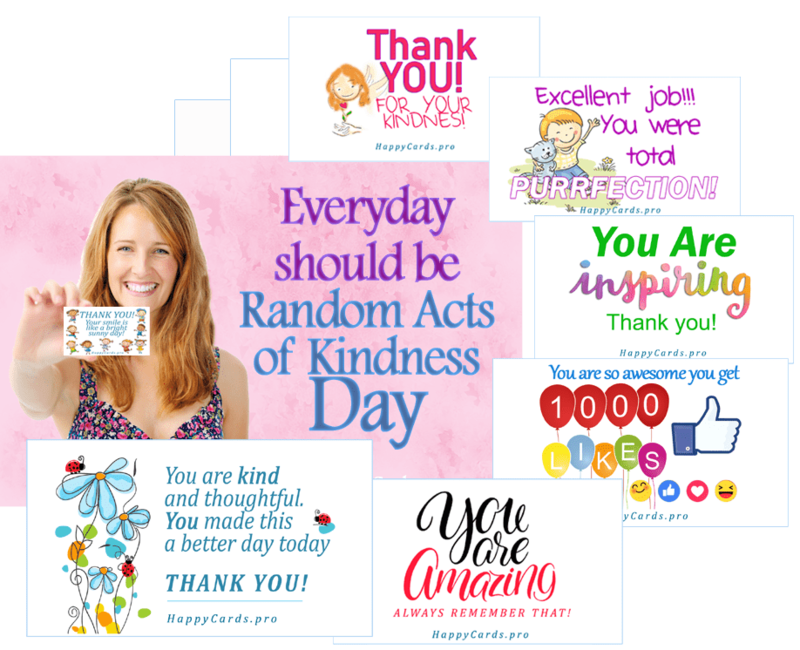 You’re really going to love how you feel when you give out one Happy Card a day to someone every day! This is going to help you and many people around you feel good again. Why? Because kindness and gratitude reduces stress. Giving Happy Cards out trains our brains to look for the good in people and our life and that is very powerful! GIVING A HAPPY CARD AWAY A DAY FEELS GREAT! YOU AND THE PERSON YOU SHARE A CARD WITH FEELS HAPPY. SO HAPPY YOU FEEL LIKE DANCING! FEEL AS HAPPY AS A DOG AT A WATER SPIGOT! YOU MIGHT FEEL LIKE DOING THE CARLTON DANCE! OR LIKE GIVING YOURSELF A BIG HUG! AND PEOPLE WILL THANK YOU! I found when I put my phone down I could lift other people’s spirits up. I could make a difference in people’s lives by simply being kind and showing appreciation! It felt great! My entire focus in life shifted from being stuck in my own problems to looking for opportunities to be nice to others and things to feel grateful for. So I created Happy Cards. What if you can feel better and even feel more amazing than going to a motivational seminar or reading a motivational book? What if you can have that feeling every day? We think Happy Cards are more powerful than any workshop you could attend or book on happiness you might read. Here’s why! Imagine how you’d feel if you could do something really meaningful every day that people appreciate you for. Imagine how good you’ll feel when you see people smile ear to ear and say “Oh you just made my day!” after you gave them a Happy Card. I’ve always wanted to feel like I matter and I bet you do to. Every one of us want to feel like we matter and that we are connected to people in meaningful positive ways. 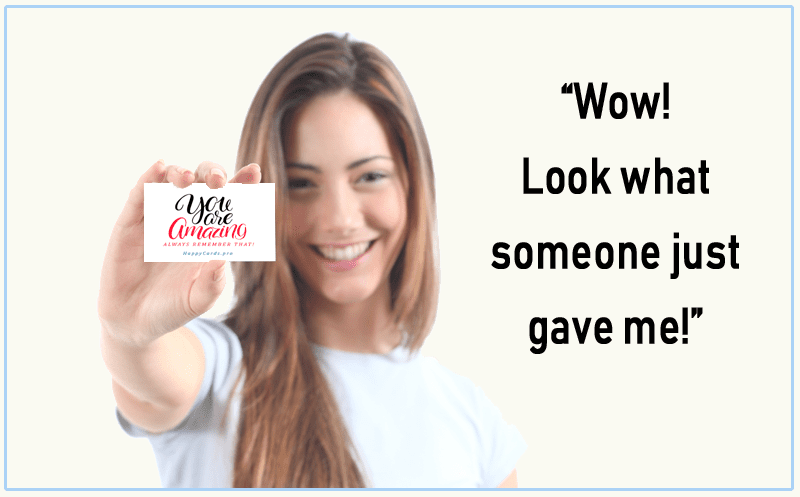 When you show your appreciation giving out one card a day to people we see, you’ll create ripples of kindness and good feelings all around you! When you order your cards below you’ll get 30 assorted beautiful Happy Cards sent to you each month. Join us in this experience of shared happiness and we are confident your life will change and together we can change our world! It’s very simple, you use one card a day to sincerely thank one person you meet, and you will experience amazing positive changes in your life because gratitude is extremely powerful. These may seem like small unique thank you cards but they are much more, they are Happy Cards! Watch the movies on this page to understand why this works. spread happiness and you can join me! Happy cards has given my life a new purpose and mission, the mission of feeling more happiness and creating more happiness everywhere around me! You can be a part of the happiness movement and create ripples of kindness, positive feelings and happiness. You can share these with your kids, your colleagues, classmates, neighbors and more! 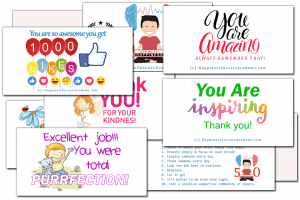 You’re really going to love how you feel when you give out one Happy Card a day to someone every day! CLICK HERE TO GET YOUR HAPPY CARDS TODAY! HAPPY CARDS AND FEEL THE AMAZING HAPPY FEELINGS! Do good! Feel good! Be great! Imagine how good you’ll feel by sharing a moment of kindness with someone at work, at home, someone you meet while you’re out living your busy life. Your life will improve when you put down your phone for a moment, and pickup someone’s hopes by simply saying thank you by handing someone one of these unique Happy Cards! Doing this says “I appreciate you!” And focusing on appreciation and gratitude is one of the most powerful ways that you can feel better every day. It also helps us create more positive relationships in our lives and our communities and that helps us all! FIRST SET OF HAPPY CARDS! Get an example of the power of these affirmations by watching these affirmations below and repeating them out loud daily. This will help install self-loving core life principals into your subconscious mind that will help you support your health and happiness. Watch the affirmation below it will change and reveal new affirmations after a few seconds. Try it now! Get the book! Read more about how and why these affirmations can help you. Download this free book and get these affirmations sent to you today! Money and success flow to me in rivers of good fortune filling my heart with gratitude. I feel loved and appreciated by people and I love and appreciate myself! Strength and self-confidence is my natural state. I easily get the things done I want to get done. I easily create wealth and success in ways that support my health and happiness. in its own perfect way and time. to the happiest best version of myself possible. Every deep breath I take brings me peace and good health. I am loved and safe. The Universe supports my health and happiness! I am impervious to other people’s opinions of me and take criticism as an opportunity to improve myself. I am noticing more happy coincidences in my life every day! and feel a connection to my higher purpose in life. my family and the world. I easily create more money! and I achieve the things I care the most about easily. and releases the stress I’ve held on to in the past. I let go of my anger and resentment now and forever because I choose happiness. I am grateful for my happy healthy life and the kind people I attract to help me. I am a naturally happy person! The Universe supports my happiness and sends me the help I need to achieve my dreams! in achieving all my goals and desires. see good people coming into my life more often. I am at peace with myself and allow my happiness to grow every day. I am the type of person who never lets stress get me down. I am one of those naturally lucky people that things go well for! and see all those I may have harmed or offended forgiving me too. Every molecule I’m made of vibrates with perfect health and vibrant happiness! I am great at letting the little things go and focusing on what brings me joy in life. I feel confident in my abilities to rise above my challenges and see the greatest good. It’s all good! I trust everything is working out for my highest good. Learning and improving comes easily to me. I get better and better every day. I am capable of handling anything that comes my way with intelligence and courage.